I am a Precious Moments fan and love to collect their pieces. One of the first pieces I ever purchased was a baby’s first Christmas ornament for our tree. My love for Precious Moments products started that day and has only expanded and grown over time. This Father’s Day I found myself exploring the Precious Moments lineup of figurines to honor Dad. One really hit me right away and reminded me of all the days when I was young and sitting fishing with my Dad. My Dad and I loved to go fishing together. I have what seems to be an endless number of fishing memories that I can feel myself smiling over as I remember them and that is why I fell in love with the Precious Moments’ “I Love Spending Time With You” Bisque Porcelain Figurine. 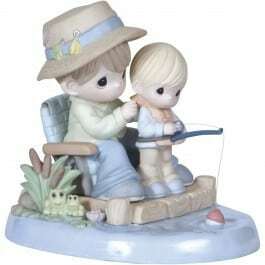 When I look at my Precious Moments figurine, “I Love Spending Time With You”, I see me and my Dad fishing. What amazing memories I have and hold dear to my heart. *Great attention to detail – even have a bobber sitting in the water. *Characters could be a dad or grandpa with a girl or a boy because of their generic characters. *Good size at about 5 and a half inches at its tallest part. *Frogs sitting at the side that tap into the surrounding sounds when out fishing. All I really can say is that I love it, love it, love it. This is a very previous collector piece for me and one that Dad will surely love. Something that I have found with Precious Moments is that they really know how to capture life moments in their products. So if your dad was maybe not the fisherman that my dad was, there is an entire lineup of other amazing dad moments capture by Precious Moments. We love our Precious Moments’ collection and I often spend hours just exploring and pondering what figurine will be the next for my collection. Disclosure: MomMomOnTheGo was provided product for the purpose of conducting this review. As always, MomMomOnTheGo only supports compani, s, products and services that she loves.